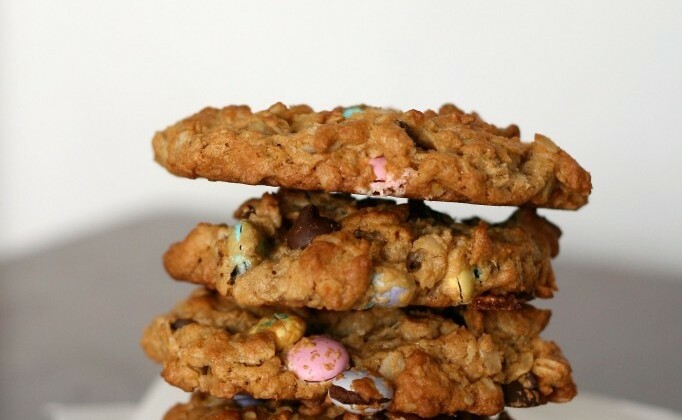 Giant cookies filled with peanut butter, oatmeal, chocolate chips, and M&M candies are the perfect treat. Don’t you think? This recipe is one that has stood the test of time. I first posted about these cookies in 2009 but figured an update was due. I based my recipe off my Great Grandma Nona’s recipe. She used flour in her recipe which I left out in mine and added in some more oats to help keep the cookies together. The result is a wonderful chewy oatmeal peanut butter cookie. She was a wonderful baker and cook. She actually worked for many, many years as a lunch lady in the Spencer, IA schools, so she had tons of experience. This was back in the day when lunch ladies actually cooked and prepared real lunches instead of heating up processed food like most school cafeteria workers have to do today. This current batch of monster cookies was baked for the teachers and staff at the girls’ school. Last week was teacher and staff appreciation week at the school and PTA parents brought in baked goodies for the teachers and staff to enjoy in the staff lounge. I took an informal poll on my Facebook pageÂ wondering what your favorite cookie flavor was. Monster cookie won hands down. 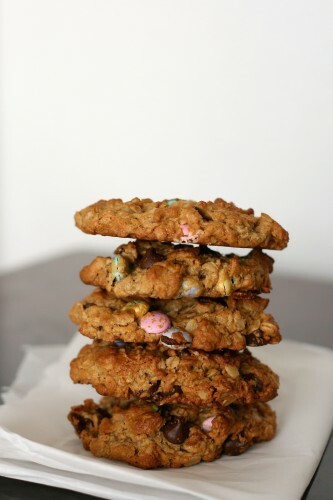 So I delivered monster cookies to the school and you get to benefit from an updated recipe with clearer directions! Win-win. These cookies freeze beautifully if you want to save them. In a mixing bowl cream together butter and sugars for 2-3 minutes. Add in eggs one at a time. Mix in vanilla. Mix together peanut butter until smooth and well combined about 2 minutes. Stir in soda and oats. Using a wooden spoon stir in chocolate chips and M&Ms until completely combined. Refrigerate for at least 1 hour but overnight is better. Preheat oven to 350 degree F. On parchment lined baking sheet scoop out cookie dough using 1/4 cup measuring cup. Leave 2-3 inches between cookies since they do spread. Bake for 12-15 minutes. Cookies will still be slightly soft in the middle. Allow to cool on cookie sheet for 5 minutes before moving to cooling rack to cool completely. Holy cow do those cookies look insanely good!! Monster cookies are also awesome straight from the freezer!!! My kids loved them that way in the hot hay field! Have you ever made the Doubletree cookies? Kath -I haven’t tried that recipe yet. I have come across it several times maybe one of these days I will finally give it a go. Oh my goodness! 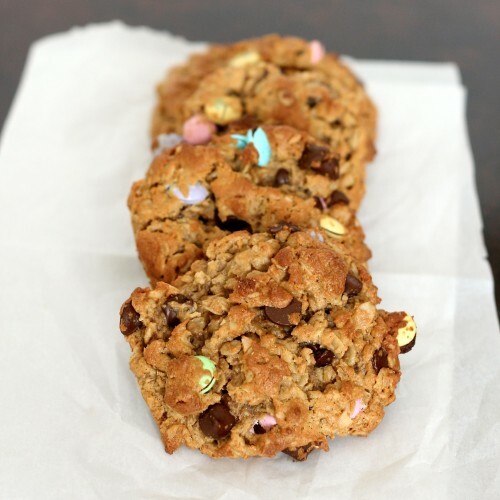 A fabulous looking cookie recipe with no flour. I’m going to have to try these. I’ve made the flourless peanut butter cookies and added oatmeal to them but these have even more wonderful things added in. You mean giant cookies filled with everything delicious and amazing? Yeah, I’m in! !